Cuba's Narbeleth have returned with a new recording which continues the dark, raw and blasphemous style of black metal from previous releases and this is a review of their 2017 album "Indomitvs" which was released by Folter Records. A very fast and raw sound along with a great amount of tremolo picking and blast beats starts off the album along with some grim black metal screams and dark sounding melodies a few seconds later and the solos and leads stick to a very melodic style while you can also hear all of the musical instruments that are present on the recording. Throughout the recording you can hear a great mixture of slow, mid paced and fast parts while demonic growls a are also used at times and the music also has a lot of second wave influences but also maintaining a very modern atmosphere and clean singing can also be heard briefly and they also gives the music a more ritualistic feeling while one track adds in a small amount of classical guitars and they also close the album with a cover of Arckanum's "Dadmellin". 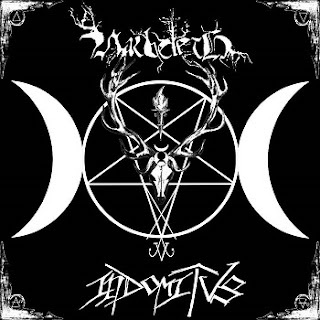 Narbeleth creates another recording that remains true to the dark, raw and blasphemous style of black metal from previous releases, the production sounds very raw and old school while the lyrics cover Occultism, Darkness and Blasphemy themes. In my opinion this is another great sounding album from Narbeleth and if you are a fan of dark, raw and blasphemous black metal, you should check out this recording. RECOMMENDED TRACKS INCLUDE "The Distortion Of Life" "Herald Of The Dawn" and "Sinister Laberynths Of The Human Soul". 8 out of 10.